Charging the Earth - Solar! : Japan now gets Solar! 27 Jan 2014: After the terrible experience of the Japanese Tsunami a couple of years ago, and the consequent damage to the nuclear reactor at Fukushima, Japan is finding a new way forward. They are applying their ability to think Big by applying it to solar farms. 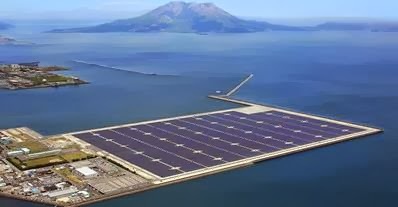 The amount of flat land in Japan is limited, so this Kyocera sea based one, facing in a westerly direction is saving land, generating energy and is safe against Tsunami (which comes from the east). This one is the "Mega Solar Power Plant Kagoshima Nanatsujima". Whatever the transient cost modelling between nuclear and solar, the one largest factor which is beyond costings is long life safety - this farm can be renewed panel by panel if parts go wrong, workers will not suffer radiation, nothing will melt or blow up, and nearby communities will be safe to live in. The construction of the mega solar plant began in September 2012 and inauguration was held in November 2013. The project has an annual power generation capacity of 78,800MWh and is expected to supply clean electricity to approximately 22,000 average households while also reducing 25,000t of CO2 per year. Although we think that Japan seems somewhat northerly compared with most of China, it is in fact at the same solar latitude as Iran-Iraq - plenty good enough for good solar power generation. It has a cooler climate because it is a maritime climate zone. I hope this solar farm does very well.